Hello! It's time for a brand new Mojo Monday sketch (#240). It's also May contest week! Be sure to play along for a chance to win some Verve stamps! Mother's Day is just around the corner, so I took the opportunity to make a card for my mom. 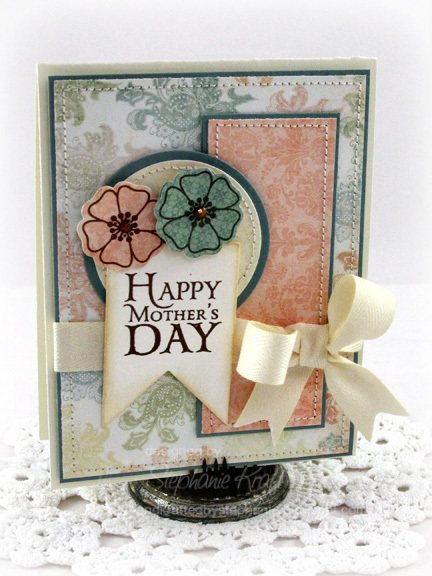 I stamped "Happy Mother's Day" (from Love Deepens) onto a piece of cardstock that I die cut with the Ribbon Banner Die. I also added a couple of flowers (the smallest one from Joyful Blooms) which I stamped and cut using the coordinating Joyful Blooms Die Set. Accessories: A Cut Above Dies: Ribbon Banner Die, Joyful Blooms Die Set (Verve); Standard Circle Nestabilities (Spellbinders), Ivory Cotton Twill (The Ribbon Carousel), Crystals (Prima), Foam tape, Thread, Sewing machine. Lovely take on the sketch, Stephanie :) Belated Happy Birthday and a congrats on the TE Team!! Such a pretty Mother's Day card Stephanie! Love the pretty patterned paper and the sweet blossoms! Thanks for the inspiration! This is luscious and wonderful! Your layers all look like they belong together! Oh I just love everything about this card!